Download "Chapter 14: Links. Types of Links. 1 Chapter 14: Links"
1 1 Unlike a word processor, the pages that you create for a website do not really have any order. You can create as many pages as you like, in any order that you like. The way your website is arranged and organized is through links. A link is simply the web address of a page or file. Since each page of a website has its own web address, you can use links to send your visitors to any part of your site or to any other website on the internet. Without links, visitors cannot go to all of the pages on your website. Every page that you want your visitors to see must have a link that will take them there. You decide which pages in your Project to link together for the internet and which pages to leave in the Project file. 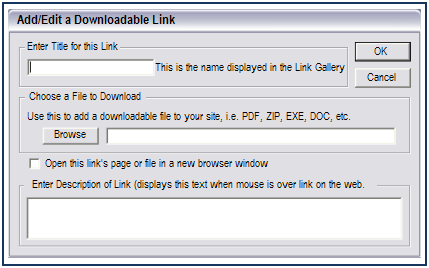 The Links Gallery is an easy way to use page links, downloadable file links, and any other links that you want to use on your website. The Site Links section in the gallery lists all of the pages by name in your Project. Each time that you create a new page, the link is automatically added to the Site Links list. 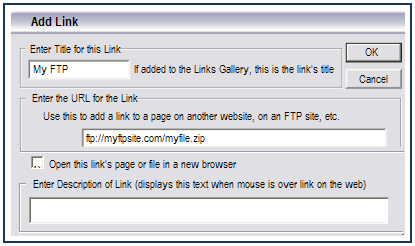 The My Links and File Links sections allow that you to add your own links to the gallery. You can even add more sections and organize your links to make them easy to use. To use any link from the gallery, you drag and drop Some objects cannot have links, such as Flash animations, sound objects and video objects. Web Studio knows what objects cannot have links and won t let you add them. the link onto an object. Links can be added to any text or object on the page, but each item can have only one link. You can also add links to objects from the right-click menu and the Links commands in the Insert tab. Types of Links Link. A connection to any page on your site or to any other page on the internet. Page Link. A link that takes you to a page in your own website. Footer Links. The row of text links that you see at the bottom of a webpage. The Footer Links command in the Page tab places these links on the pages of your website. You decide which pages to include in the Footer Links and which pages to exclude. Anchor. This is an intra-page link. Anchors link one location on a page to another location on a page. For instance, an anchor can take visitors back to the top of a page. They also can take visitors to a specific spot on another page, such as a map. File Links. File links are links that reference a file on your site. This type of link is used so that people can download files from your site by clicking a button or text link. 3 3 is displayed for them. Other files such as PowerPoint, Excel, and more can be used in this manner. If the visitor s browser does not have a plug-in for the type of file that is in the File Links, a dialog will open so the visitor can download the file to their computer for later use. Internet Explorer Links. When Web Studio starts up, it scans your computer for your IE Favorites. It then puts them all in the Links Gallery organized in accordance with the folders you have created for them. To turn this feature on and off, go to the Web Studio Button and click on Options at the bottom of the drop down window. 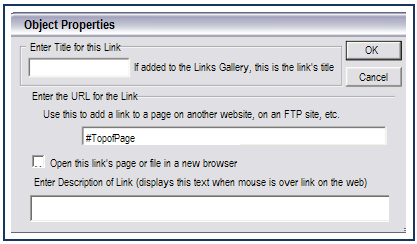 Check or uncheck the box next to Link Gallery Preferences>Add Internet Explorer Favorites to Link Gallery. Adding New Links to the Links Gallery The Links Gallery has two sections where you can add your own links: My Links and File Links. After you add links, you can drag and drop them onto an object on the page just like the other links in the Links Gallery. My Links. Add web page links, links, and FTP links to this section. File Links. Add file links that can be downloaded from your site. 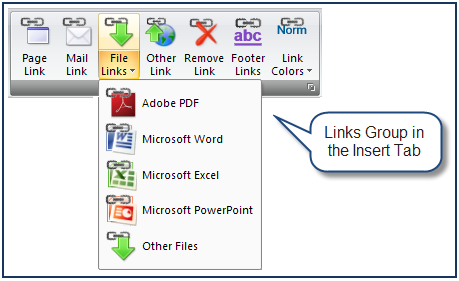 These links include files such as PDF, ZIP, EXE, DOC, XLS, etc. Add a link to My Links Right-click over a blank spot in the My Links list. The right-click menu opens. Choose Add Link from the menu. The dialog opens. 4 Fill in the following fields: Title. This is the link title that will be displayed in the My Links list in the gallery. URL. Enter the URL of the link. The dialog already has in it so you can just type the rest of the address, such as Open this link s page or file in a new browser window. Check this box if you want the link to open in a new browser window. This allows your visitors to visit other sites without leaving your site. Description. This is the message that viewers see in a small pop-up window when the mouse is moved over the link. Click OK when you are finished. The link is added to the My Links list. Add links to My Links Right-click over a blank spot in the My Links list. The right-click menu opens. To add an link, delete the Choose Add Link from the menu. The dialog and then key in mailto: opens. Fill in a title for this link. Delete the text in the URL field Key in mailto: and then the address. It will look like this: Click OK.
5 Add FTP links 5 Right-click over a blank spot in the My Links list. The right-click menu opens. To add an FTP link, delete the Choose Add Link from the menu. The and then key in ftp:// dialog opens. Fill in the title. Delete the text Key in ftp:// and then the address of the file on the FTP site. It will look like this: Click OK.
6 Add file links Right-click over a blank spot in the File Links section. The right-click menu displays. Choose Add File Link. The Add/Edit a Downloadable Link dialog opens. Fill in the following fields: Title. This is the link title that will be displayed in the File Links section in the gallery. Choose a File to Download. Click on the Browse button. The Open dialog opens. Choose the file that you want to link and then click Open. This is the file that is added to the File Links section. Open this link s page or file in a new browser window. Check this box if you want the link to open in a new browser window. This allows your visitors to visit other sites without leaving your site. Description. This is the message that viewers see in a small pop-up window when the mouse is moved over the link. Click OK when you are done. The link is added to the File Links section. Add new link categories When you have a large number of links, you can sort them into your own categories. You can place any type of link into these categories. For example, you may want to have a category of links for each different website that you maintain. 7 7 Right-click on any link category except the Site Links section. Choose Add New Link Category from the menu. The Enter New Link Category Name dialog comes up. Enter the name for the category and click OK. The new link category is added. Delete link categories Right-click on the link category to be deleted. Choose Delete Link Category from the menu. The Delete Gallery Category dialog comes up asking if you really want to delete the category. Click OK to delete the category. Linda, the dialog said This cannot be done! but guess what? They lied When you delete a category, all of the links are deleted. Links that were already added to your site will still work. When you change a link in a category, it does not change the link that is already added to an object. Edit links in the Links Gallery Right-click on the name of the link to be edited. The right-click menu pops up. Choose Edit Link from the menu. Edit the link s info and click OK when you are finished. Adding Links to Buttons and other Objects Find the Cursor s Hot Spot The tip of the cursor has a hot spot that is very important when you are adding links. As you drag a link from the gallery, you will notice that a little box with a + sign appears below the cursor. This is not the hot spot. The hot spot is the tip of the cursor. When you drag a link from the gallery, keep the mouse button pressed until the hot spot is over the object and then release the mouse to drop the link. Make sure that you do not drop the link until the hot spot is over the object or else the link may not work. You can use the Highlight Objects With Links command in the View tab to check the links on the objects. 9 9 Title. This is the link title that is placed in the My Links section. URL. Enter the URL of the link. The dialog already has in it so that you can just type the rest of the address, such as Select File. Click on this button to bring up the Open dialog. Click on the name of the file that you want to link. Click Open. Open this link s page or file in a new browser window. Check this box if you want the link to open in another browser window. This allows your visitors to visit other sites without leaving your site. Description. This is the message that viewers will see in a small pop-up window when the mouse is moved over the link. Click OK when you are finished. The link is added to the object. Using the Link Commands to Add Links The Insert tab has a Links group that contains all of the commands for links. These commands make it possible for you to link to pages within your site, create links, links to files, links to URLs, Footer Links, and even choose the colors that you want to use for text links. In addition, the Home tab has some of the most commonly used links and the Text tab has all of the links that relate to text. You can add a link to any object or text on the page. 10 Add a link to a file Select an object or text that you want to link to a file. Click on Insert > Links > File Links>the desired link. 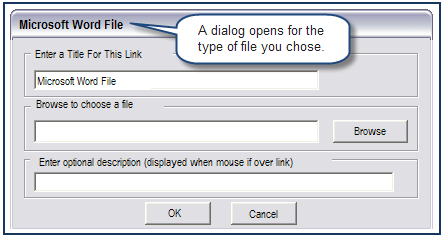 A dialog opens for the type of file you chose. If you selected Other File, the Choose a File as a Link window opens. All dialogs give you an option to Browse for a file. Fill in the following fields: Enter a Title for This Link. The default setting displays the file type that you chose. You can change this to give it a specific name. Browse to choose a file. Click the Browse button. The Open dialog opens. Choose the file that you want to link and then click Open. This file is linked to your text or object. Enter optional description. The text that you enter in this field will be displayed when your visitor moves the mouse over this link. Click OK when you are finished. The file is now linked to the object. Go to Home > Preview > Preview Page or any other Preview Page command to see the linked file. Click on the object. This opens the File Download dialog which gives your visitors a choice to Open the file, Save the file or Cancel the action. 11 11 Create an link An link can be added to any object on the page without adding it to the Links Gallery first. Select an object. Click on Insert > Links > Mail Link. This opens the Link dialog. Enter the address in the field. Click OK. Click on any Preview command to check the link. In the Preview window, click on the object. A blank window opens. You may send an or close the window. Close the Preview page. An link will work only if your website visitor has set up an program on their computer. 12 Link to a page Select an object. Click on Insert > Links > Page Link. This opens the Add Page Link dialog. Enter a title for the link. Choose a page from the drop down list. Enter an optional short description for your visitors that will be displayed when the mouse is moved over the link. Click OK when you are finished. Add other links Use this command to open the Object Properties dialog that provides you with options to link to a file, a URL, or an anchor. Select an object or text. Click on Insert > Links > Other Link. This opens the Object Properties dialog. Click on the Links section. Enter a title for the link. Fill in a URL or select an anchor or a file. Enter an optional short description for your visitors that will be displayed when the mouse is moved over the link. Click OK when you are finished. 13 Adding Links to Text 13 Links can be added to any amount of text in an object. You determine what text in the text object should have the link and then select that specific text. It can be a character, a word, several words, a sentence, paragraph, the entire text object, or anything in between. These directions explain how to use a link from the Links Gallery. You can also use the Links command and the Object Properties dialog from the Text Menu to add links to text. Add a link to an entire text object Click once on the text object to select it. Do not double-click because that activates the text object for editing. Click on the tab to open the Links Gallery. Drag and drop the link onto the text object. All of the text is now underlined and changed to a different color. This indicates that a link has been added to the text. Add a link to a word Double-click on the text object to activate it for editing. Select the word to receive the link. Open the Links Gallery. Drag the appropriate link onto the appropriate word and drop it. The word is now underlined and changed to a different color. This indicates that a link is added to the text. Add a link to a selection of text Double-click on the text object to activate it for editing. Select the text that will have the link. Open the Links Gallery. Drag the appropriate link onto the selected text and drop it. The selected text is now underlined and changed to a different color. This indicates that a link is added to the text. 14 Working with Text Link Colors and Styles There are different ways to tell your visitors that text has a link. Text links on web pages usually have a color that is different than that of the rest of the text. This distinguishes them and identifies them as links to the visitor. The colors can change to show that the visitor has never visited or already visited the link. The color also can change when the visitor moves the mouse over the link. Another web convention is to underline text that has links. Any and all of these options are available in Web Studio. Change the link colors on a page Click on Text > Links > Link Colors. Move the mouse over Link Color, Visited Link or Hover Color. As you move the mouse, the Colors dialog is displayed. Click on one of the basic colors to apply it to the link. If you want more color choices, click on Eyedropper & More. This opens the Colors Standard and Colors Custom dialogs. Choose a color from one of the dialogs or use the Select button to change your cursor to an eye dropper. 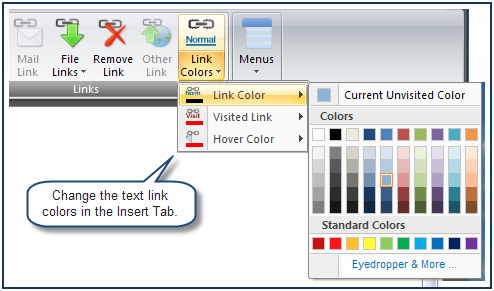 Click the eyedropper on any color in your monitor to select the color. See the Color and Shapes chapter for a detailed description of the Colors dialog. Click OK when you are finished. Choose a color for each link state. Go to Home > Preview > Preview Page or any other Preview Page command to see the links. 15 15 Notes about Link Colors Note 1. The link color changes show only in Preview and on the internet. Note 2. If you use unsafe fonts, your link colors may not be correct. See the Text chapter for more information about web safe fonts. Note 3. Applying link colors and styles to all pages may take some time since each page must be modified. If you want to use the same color and styles on all of the pages, use the Web Studio Preferences dialog. See Apply underlines and link colors to the whole website later in this chapter. Add or remove the underline on text links Click on Web Studio Button>Options at the bottom of the menu. This opens the Web Studio Preferences dialog. Check the Underline Link box to underline the Unvisited, Hover Over or Visited links. Uncheck the box to remove the underline from the Unvisited, Hover or Visited links. Click OK when you are finished. Go to Home > Preview > Preview Page or any other Preview Page command to see the links. You can also change link colors in this dialog. The underline and link color changes will be displayed only in Preview and on the internet. 16 Apply underlines and link colors to the whole website If you are using the same color and style for the whole site, this feature can save you some time. Even if you choose this option, you can override it by changing the colors on an individual page. Click on the Web Studio Button>Options at the bottom of the menu. This opens the Web Studio Preferences dialog. Check or uncheck the boxes to turn the underline style on or off for Unvisited, Hover Over or Visited links. Click the Link Colors for Text buttons to change the color of the Unvisited, Hover Over, and Visited link colors. Check the Apply new link color and underline settings to all pages in this website checkbox. Click OK when you are done. Go to Home > Preview > Preview Links/Website or any other Preview Links/Website command to see the links. Opening Links in a New Browser Window You may want to have a link open in a new browser window. This is important if you do not want your viewers to navigate away from your site when they click on a link. 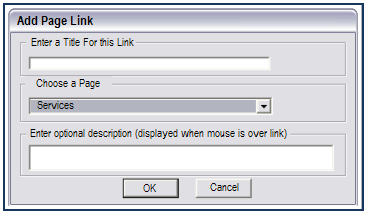 Every link dialog has a field to choose to open the link in a new browser window. Right-click over an object with a link. Click on Add/Edit Link from the Selected Object Menu. This opens the Object Properties dialog. When you choose to open a link in a new browser window, it does not affect the other links on the page. You must choose this option for each link that you want to open in a new browser. 17 17 Check Open this link s page or file in a New Browser window. Click OK. Go to Home > Preview > Preview Links/Website or any other Preview Links/Website command to see the links. Removing or Editing Links on Objects or Text You can remove, edit, or replace links on objects or text. When you want to replace a link, you do not need to remove the first link. Simply edit the link and the new link automatically replaces the current link. Use the Links Gallery or the right-click menu to add, edit, or remove links. In addition, the Home and Insert tabs each have a Remove Link command. Edit or replace links If you drag another link from the Links Gallery onto an object with a link, the link is automatically replaced with the new link. Right-click over the object or text with the link. Click on Add/Edit Link from the menu. This opens the Object Properties dialog. Make changes in the dialog. Click OK when you are finished. Drag and drop a link from the Links Gallery to replace an existing link Click on the Links tab to open the Links Gallery. Drag and drop a link onto an object or text with an existing link. The new link replaces the existing link. 18 Remove links using the right-click menu Right-click over the object or text with the link. 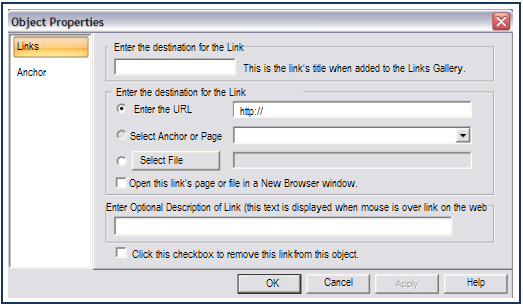 Choose Remove Link from the Selected Object Menu or the Text Menu. Remove links using the Remove Link command Select the object or text with the link. Click on the Home or Insert tab. Click on the Links > Remove Link command. Adding Footer Links Footer Links are the small text-based links along the bottom of the page that are separated by vertical bars. These usually contain a link to all of the pages on a website. Footer Links use information from the Page List to create the links. The pages are added to the Footer Links by name in the order they appear in the Page List. You can change the list order so that the Footer Links appear in the order that you want them to be on the page. If you have not renamed your pages, the links will display Untitled 1, Untitled 2, etc. All the pages in the Page List are automatically included in Footer Links by default. Since you probably will have more pages in your Project than you want to upload to the internet, you can choose to remove any page from the Footer Links and then add it again if you want. 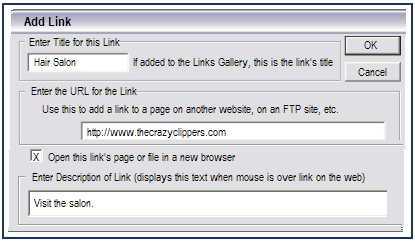 When you are ready to insert Footer Links onto your page, click on the Footer Links command in the Insert tab. Once Footer Links are on a page, they do not update automatically when you change the page names, page order, add new pages, or delete pages. However, it is easy to update the links by clicking again on the Footer Links command. When you are building a website, Footer Links may be one of the last things that you want to do. Add or remove pages from the Footer Links It is easy to tell which pages are included in Footer Links by looking at the Footer Links command in the Page tab when a page is open on the workspace. If the page is included, the Footer Links command is highlighted. If the page is not included, the Footer Links command is not highlighted. Another way to see if a page is included in Footer Links is to view the page s right-click menu. A check in front of Include in Footer Links means that the page is included. Pages that are excluded do not have a check. 19 19 Use the Page List to add or remove a page in Footer Links Go to the Page List. Right-click on a page s name to see the menu. Look for the Include in Footer Links item in the menu. Click to place or remove a check in front of this command. A checkmark indicates that the page is included in Footer Links. If it does not have a checkmark, it is not included. Another way to see this menu is to click on the page s name to select it. Then go up to the Page List button and left click on it. This displays the same menu as the page s right-click menu. Use the Include Footer Links command to add or remove a page Add a page: Click on Page > Include Page In > Footer Links to highlight the Footer Links command and include the page in the Footer Links. Remove a page: Click on Page > Include Page In > Footer Links to remove the highlight from the Footer Links command and remove the page from the Footer Links. When a page is included in Footer Links, the Footer Links Command in the Page Tab is highlighted. 20 Put Footer Links on a page Add Footer Links with the Footer Links command in the Links group. The best way to add them is to place them on the Master Page. This will automatically add them to all of the pages. 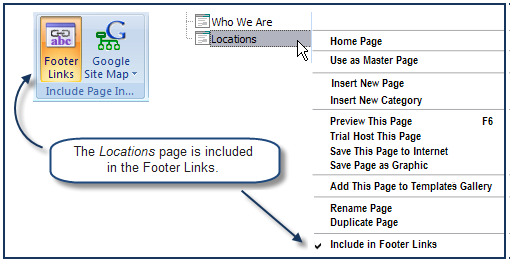 If you are not using a Master Page, then you must put the Footer Links on each page. Open the Master Page or any page by clicking on the tab. Click on Insert > Links > Footer Links command. Footer Links are added to the page. Drag to position the Footer Links or use any of the object commands to place them where you want them. See Working with Text Link Colors and Styles earlier in this chapter to learn how to change the color of the Footer Links. Since Footer Links do not update automatically when you add or remove pages, it is best to add them last when you are building your website. If you make a change to Footer Links after they are on a page, simply click the command to insert the Footer Links on the page again. This updates the Footer Links. Change the page order for the Footer Links You can change the order of the Footer Links in the Page List window. The changes in the Page List are not made automatically in the existing Footer Links on the pages. After making changes, simply add the Footer Links again. The new links will replace the existing links. Change the page order using the right-click menu Right-click on the name of the page you want to move. Choose Move Up or Move Down. The page is moved in the list. Change the page order using keyboard shortcuts Click on the page name in the Page List. Press alt+page up to move the page up the list. Press alt+page down to move the page down the list. 21 Using Anchors 21 An anchor is a type of link that takes visitors to a specific location on any page within your website. The anchor is placed on an object on the page. Another object is placed on a page with a link to the anchor. When visitors click on the link to the anchor, it brings them to the spot on the page where the anchor is located. Anchors can make navigation easier, especially in a large site. For instance, you can use an anchor at the bottom of a long page to bring visitors back to the top of the page, or you can also have a link on the Home page that takes you to an address at the bottom of the Contact page. There are two steps to use anchors: 1. Designate an object to be an anchor. 2. Link to the anchored object. Any object can be used as an anchor. First the object is assigned anchor properties and then placed in the Links Gallery. Once an anchor is in the gallery, it is ready to link onto any other object or text. Remember that the link takes your visitors to the anchor. This means that if you move the anchor, you change the location where the visitors go when then click on the link. For example, if you want to use an anchor to take the visitors back to the top of the page, make sure the anchor is not at the bottom of the page. Designate an object to be an anchor Open the page and locate the object that you want to use as an anchor. Open the Links Gallery. Drag and drop the Add Anchor to object link onto the object. This opens the Add Anchor dialog. Enter the following information in the dialog: Title. Enter a title for the anchor. This is the name that will be displayed in the Site Links list. Description. Enter the description for the anchor. This is used on the web to display in a small pop-up window when a visitor moves the mouse over the link to the anchor. Click OK. This adds the anchor to the Site Links list in the Links Gallery. 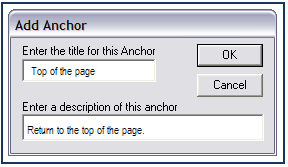 The title of the anchor is displayed in the list. Position the anchor on the page. Now you can link any object to the anchor. 22 Linking to an Anchored Object Use the Links Gallery to link to an anchor Locate the object or text that you want to link to the anchor. Open the Links Gallery. 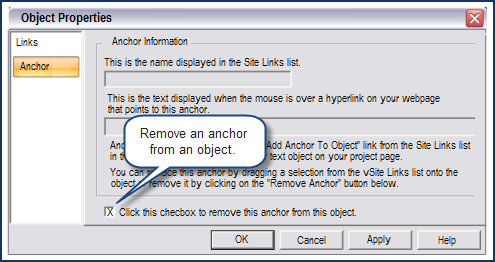 Drag and drop the name of the anchor from the Site Links list onto the object or text. The object or text is now linked to the anchor. Check the anchor using the Preview Links or Preview Website commands. Use the Properties dialog to link to an anchor Right-click over an object that you want to link to the anchor. Choose Add/Edit Link from the menu. In the URL field, enter # followed by the name of the anchor. The name of the anchor can contain spaces. Click OK to create the link. Remove an anchor link Right-click over the linked object. Click on Add/Edit Link from the menu. Click on the Anchor section. Check the box in front of Click this checkbox to remove this anchor from this object. Click OK. The anchor is removed. 23 23 Previewing Links The way to check the links on your site is through one of two Preview commands: Preview Links or Preview Website. Both of these commands place your website in a browser window so that you can check all of the links, including links to other websites. Because the Preview Page command only places one page in the browser window; you cannot check your site links with this command. The Home and Page tabs have Preview Links or Preview Website commands. Both of these Preview commands allow you to view your entire website; not just one page. Click on Home/Page > Preview > Preview Links or Preview Website. When your website opens in the browser window, click on all of the links to make sure they are working properly. The Web Studio browser opens as a page on the workspace. It has a tab labeled Preview Site: Untitled. The Default browser opens in your internet browser window. Close the Web Studio browser by clicking the X on the Preview Site tab. Close your internet browser as you normally would. 24 Highlighting Objects With Links Since links are invisible pathways, it is impossible to see them on buttons and other objects. In order to check how links are working, you must use the Preview Links or Preview Website commands. However, the easiest way to simply see what objects contain links and what objects do not have links is to use the Highlight Objects With Links command. Highlight objects with links Click on View > Highlight Objects>Objects With Links. Every object with a link has a red box around it. If you do not see a red box, this means that the object does not have a link. To turn off the highlight, click on the Don t Hilite command. Turn off the highlight on links Click on View > Highlight Objects>Don t Hilite. Inserting a Google Map There are two ways to use Google Maps on your website. You can place a map on your page using the Google Maps command or create a link that takes your visitors to Google Maps. Insert a Google Map on a page Click on Insert > Google > Google Maps. This opens the Google Maps Properties dialog. 25 25 Click on Go to Google Maps. This opens the Google Maps website in your browser. Choose the map that you want to use. Click on Link in the upper, right corner of the map. 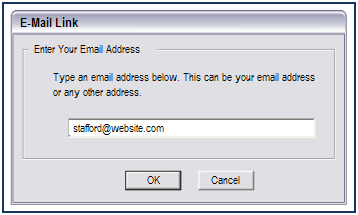 This opens a dialog with the link and HTML information. Click to select the text in the Paste HTML field. Right-click over the selected text and choose Copy from the resulting menu. Go back to the Google Maps Properties dialog in Web Studio. Right-click in the Paste the Google Maps HTML field and choose Paste from the resulting menu. Click OK. This places a Google Maps object on the page. Resize and position the object. Click on any Preview command to see the map on the page. Click on Customize and preview embedded map to make changes to the map. If you want to remove the address balloon from the map on your page, delete the address in the Google field, refresh the screen, and then resize the map. 26 Link to a Google Map Place an object or text that will link your visitors to the map. Open your browser and go to the Google Maps website. Choose a map. Click on Link in the upper right corner of the map. This displays the link and HTML information. Click on the text in the Paste Link in or IM field to select it. Right-click over the selected text and choose Copy from the resulting menu. Go back to Web Studio and right-click over the object for the link. Choose Add/Edit Link from the Selected Object Menu. This opens the Object Properties dialog. In the Links section, delete the in the Enter URL field. Right-click over the Enter URL field and choose Paste from the resulting menu. Click OK. This links the object to the map on the Google website. Click on any Preview command to link to Google. Getting Started Guide Chapter 16 Creating Web Pages: Saving Documents as HTML Files OpenOffice.org Copyright This document is Copyright 2005 2007 by its contributors as listed in the section titled Authors. such as USB drives, connected servers, DVDs, CDs, configure file labels, and the information that appears in the Finder window sidebar. TASKSTREAM FAQs. 2. I have downloaded a lesson attachment, but I cannot open it. What is wrong?